The other day a young woman who has decided to live the life of a Catholic and follow the teaching of the Church was accosted by her family who are very anti-Catholic. 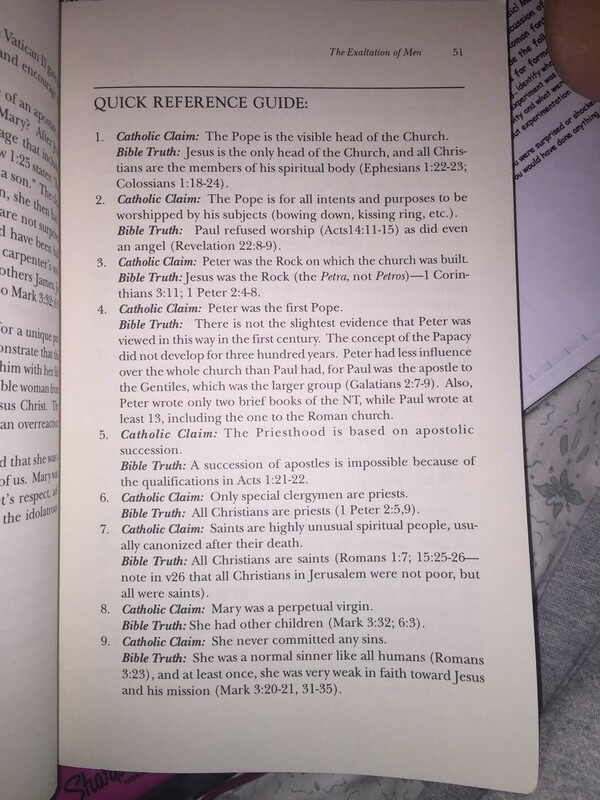 They have her a list of questions from a standard “Quick Reference Guide” which you can see on this page. She asked for help in responding. My good friend Gary Michuta (www.HandsOnApologetics.com) and an apologist par excellence took the time to answer the questions in a brief and pithy manner. 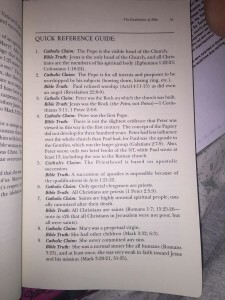 GARY STARTS: Here are a few quick responses to the “Quick Reference Guide” in your pictures. Some are stock objections while others are so weak (and wrong) that I’m surprised to find it in print. Of course, Christ is the head of the Church. No problem there. It’s equally biblical that Christ appointed Peter to have a primacy among His Apostles making him the “visible” head of His Church (Matthew 16:18-19, Luke 22:28-32, John 21:15-17). It’s also interesting that he speaks of Christ’s Church, not as a “body” (which is visible and structured) but a “spiritual body,” which Scripture NEVER calls the Church. The only place I found in Scripture that speaks of a “spiritual body” is 1 Cor. 15:44, where Paul is talking about our resurrected or glorified bodies. So his “Bible truth” is incorrect. Christ’s Church is a body, not a “spiritual” body – that’s unbiblical. He must say this, however, because if Christ’s Church is a body then it must be visible, identifiable, and have a set structure and if that is true Christ’s Church can only be the Catholic Church. To avoid this uncomfortable conclusion, Protestants turn Christ’s body into a spirit, an invisible collection of like-minded people or the elect. TO READ THE WHOLE ARTICLE AND ALL THE RESPONSES, CLICK HERE.